This list is based on an entry in Mackay’s Guinness Book of Stamps: that is organised by date and leads logically to an event-driven (that usually means conflict-based) approach. The second and more important conclusion is that there is a grey area between occupation issues and Offices Abroad (OAs). These are similarly mundane and sometimes obscure and expensive. Mackay’s definitions of the two categories do not bring clarity, but Linns online glossary is more helpful. Occupation issues are described as “released for use in territory occupied by a foreign power”, while offices are maintained “usually because of the unreliability of the local postal system”, but the distinction breaks down in Crete at the turn of the twentieth century, where Britain, France, Italy and Russia stationed troops in various sectors but both Gibbons and Scott define Britain and Russia as occupation issues but France and Italy (plus Austria) as Offices Abroad, with, incidentally, the British using the Austrian Offices. The intention is therefore to deal with both categories in this display. Mackay suggests that the first occupation issues arise from disputes between Prussia and Austria over Holstein and Schleswig in 1864 that led to the Seven Weeks’ War in 1866. Stamps were issued by the German Federal Commissioners for Holstein 1864 and then by Austria. 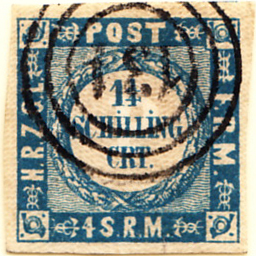 Joint stamps were at first issued for Schleswig, and Prussian stamps from 1865. 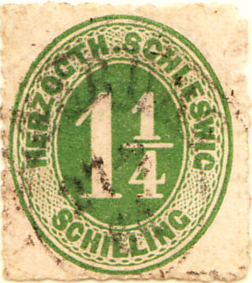 These stamps, issued by the North German Confederation, were used generally in occupied France during this conflict, but are particularly associated with Alsace and Lorraine. 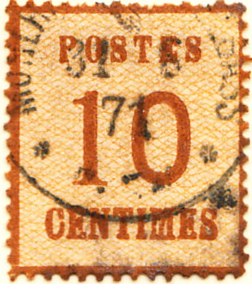 Mackay notes the diplomatic use of French on the stamps. Germany invaded these areas and issued occupation stamps again in 1940.